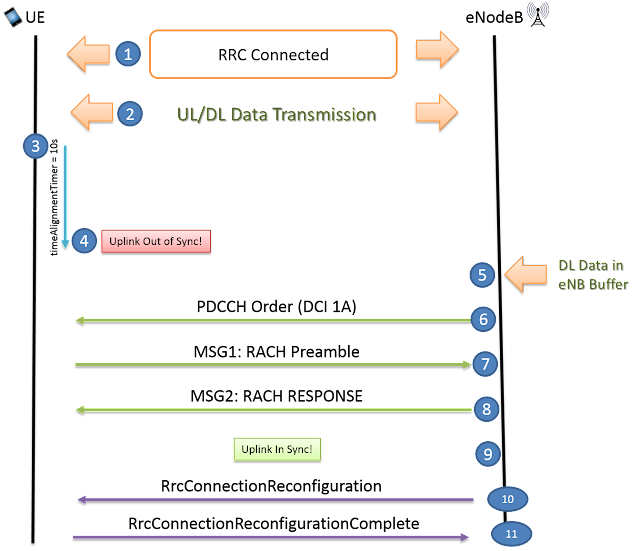 PDCCH Order is a procedure to bring back uplink out-of-sync UE (user equipment) back to in-sync state incase there is downlink data available for it. This can happen in situation when the time alignment Timer gets expired because there is no uplink and dowlink data transmission for some time and also when there is no Time alignment command recieved from eNB. Time Alignment timer basically controls how long the UE is considered uplink time aligned. UE is in sync again ! Why UE needs time alignment ? Nice post! It is an interesting one. I like blogging and follow many but this one is really amazing. may be layman question here, how eNB knows timer alignment is expired? and UE is out of sync before sending PDCCH order.